Lou Ferrigno was born into an Italian-American family in Brooklyn, New York, in 1951. An ear infection as a child caused him to lose 80% of his hearing. Lou took up bodybuilding as a teenager and, at the age of 19, won 'Mr Teenage America'. In 1973, he became 'Mr America' and later that same year, he went on to win 'Mr Universe', doing so again in 1974. He was then 6'5" tall and weighed 20 stone! Then, in 1977, came the opportunity to appear in the Arnold Schwarzeneggar film Pumping Iron, about the 'Mr Olympia' and 'Mr Universe' bodybuilding contests. That same year, 1977, Ferrigno was cast in the CBS sci-fi TV drama The Incredible Hulk, with Bill Bixby and Susan Sullivan. The story was based on the Marvel comic book character of the same name. This proved very popular and 2 further TV films based on the character, were made. In 1978, The Incredible Hulk was made into a smash-hit TV series running to 82 episodes over a four-year period. 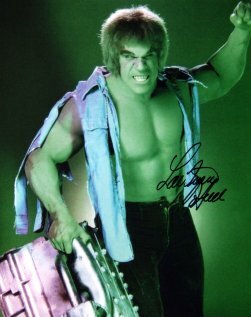 Ferrigno plays the alter-ego of Bill Bixby's character David Banner. Six years after the TV series ended, three more TV films were made - The Incredible Hulk Returns (1988), The Trial of the Incredible Hulk (1989) and The Death of the Incredible Hulk (1990), all of them featuring Lou Ferrigno. 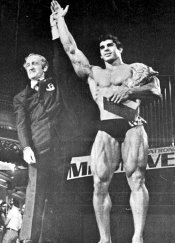 Today, Lou Ferrigno devotes his time to bodybuilding education, and his website shows his range of booklets on bodybuilding. These include his Guide to Personal Power, Bodybuilding and Fitness. He has also written a book about his 'alter ego' My Incredible Life as the Hulk. He has been married to psychopherapist, Carla, for 27 years and they both run personal fitness courses in Los Angeles. They have three children. Ferrigno continued to work in films and TV, with another film to show off his magnificent physique, Sinbad of the Seven Seas (1989), and sci-fi drama Frogtown II (1993), but his more recent roles have been very minor ones. After the success of The Incredible Hulk TV series, Ferrigno went to Italy to make Hercules (1983) which was slammed by the critics, but proved very poular with the public, so much so that a sequel Hercules II was made in 1985. 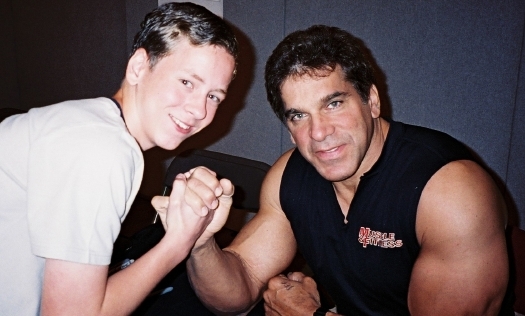 I met Lou Ferrigno at Earls Court in June 2005. He signed a photo for me of him as his famous character The Incredible Hulk. I don't think I'd be much of a match for him in a real arm-wrestling contest!! Ferrigno spent some time in the Canadian football league but never looked like becoming a top player. There is much merchandising for the Incredible Hulk in the form of posters, models etc.